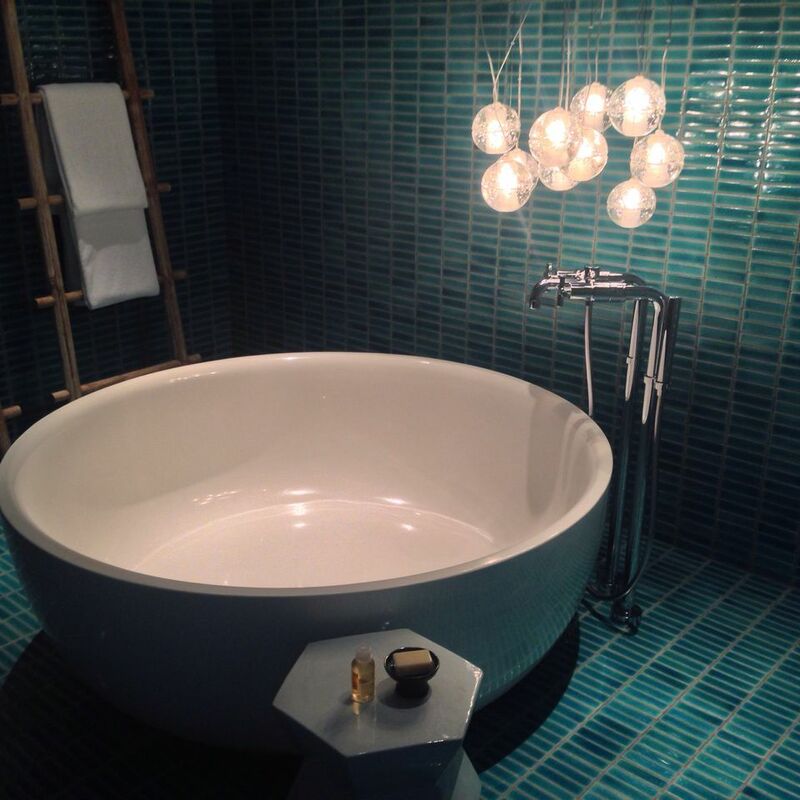 People don't often think of their bathroom as a space to display dramatic, colorful tile. But consider this: smaller spaces are great for bolder decor styles. A little goes a long way, and it makes the space much more memorable. Choosing a dramatic bathroom tile is as simple as looking through samples of colors and patterns that attract you. Because of its boldness, it needs to be something that you can appreciate in the long term and that you'll enjoy looking at years from now. Avoid impulsive choices. Once you've chosen your tile, complement with an appropriate paint color for the rest of the room. You can choose a neutral if you don't want to have any extra color outside of the tile, or you can choose a complementary to highlight an element of the tile you particularly like. If you want to use another tile in the space, choose something neutral and self-effacing, like a simple white subway tile, for example. That way, the second tile won't clash with the one you want to be displayed. Ready? 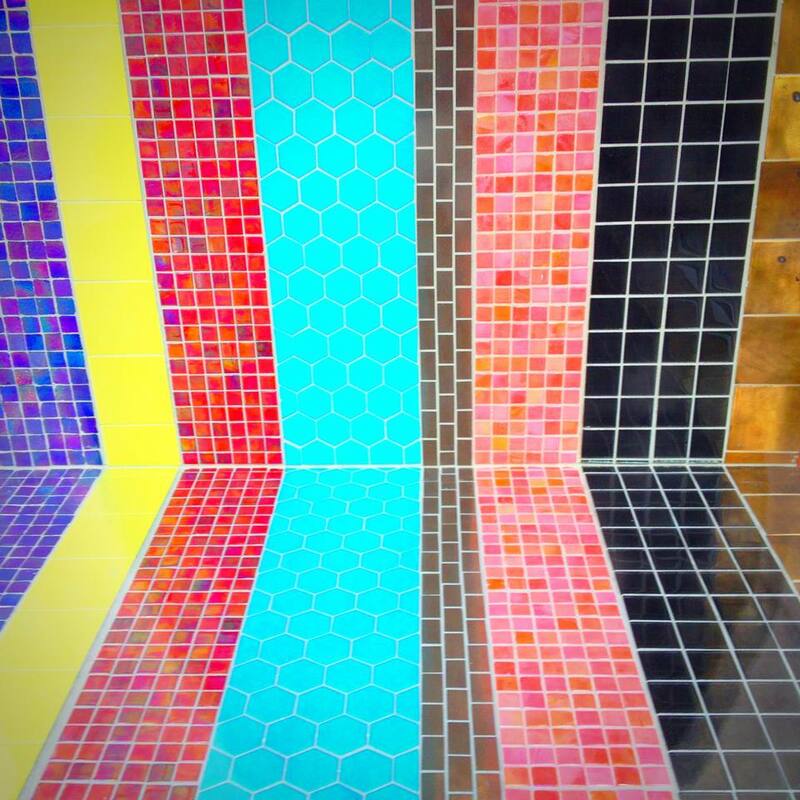 Let's have a look at some inspiring bathrooms with bold, colorful tile choices. As this example from Lizette Marie Interior Design, via Houzz, shows, you can use a bold tile on a small area for a big effect. This blue mosaic tile recalls the oval shape of the mirror, and the variegated blue bring some beautiful movement. In this bathroom by Angela Free Interior Design, we're looking at the floor tile, which is a bold choice of mosaic pattern and contrasting marble and dark grey. The hexagonal shape is unusual, and using just a little marble to delineate the shape is actually quite original. The contrasting flooring is eye-catching and dramatic. Not only is an all-black bathroom pretty dramatic on its own, but this gorgeous Parisian bathroom features a show-stopping mosaic floor tile that brightens up the space and contrasts with the black ​bevelled subway tile. This bathroom, featured on (my) unfinished home, is sure to cure you of the fear of black and the fear of patterns. Accent walls are an excellent way to express your style with bold tile. Take this design from threshold interiors, via Houzz, for example. The Moroccan-style tile in a variegated aqua/green pattern brings the beauty and peace of the sea together with the movement and style of the traditional North African decor. Against a pure white tub and floor, this reminds you of a beach with white sand and deep, green waters. Of course, you don't have to go by the patterns already decided by the designers and retailers. With patience and work, you can make your own dramatic mosaic, as this example by Artistic Designs for Living. Keep the focus on the tiles with neutral grey walls and flooring. The most humble tiles can be combined together for amazing, eye-catching patterns. Take this example by Teresa Kleeman: simple shapes in greys and black work together to form a beautiful flower-shaped mosaic. The design remains minimal – perfect for modern bathrooms – but you still get wonderful movement and focus. This simple tropical bathroom design features a wide open space filled with green plants, a simple dark wood bench, and an all-over blue mosaic tile. This design by Adriana Lopez, via Houzz, shows that even large tiled areas can be dramatic, especially when it contrasts with more organic shapes. Luxurious and dramatic, this black and white marble chevron floor, paired with black marble wall, shows what you can do with larger shapes. This bathroom by Evolution Design is ultra-modern thanks to its stunning monochrome scheme, which makes the dual sink seem to disappear in the background. This beautiful bathroom by My Life From Home mixes the warm tones of brass and wood with the dramatic contrast of black and white mosaic. This turns this small wall into a focus area for the bathroom, and gives it movement and depth.